In addition to predefined file organizing rules user can create custom rules in File Organizer dialog and either apply (run) it immediately or use from context menu. 2. Click Organize Files > Customize command in view's toolbar where File Organizer is used. Assign text label for virtual disk to recognize in Recovery Explorer. Optional. User can decide to leave files as-is (default value) or rename every one of them by using file name pattern (see: File name tags) or choose to rename every file by file name pattern associated with file type (see: File renaming patterns by File Type). Select virtual disk boundaries, by default - entire original physical disk is used. Double click on child elements in edited rules to open drop-down control with folder pattern choices. Each following folder pattern depends on previous choice. E.g. if media file pattern selected then all following pattern choices will be relevant to media files. See File attributes and meta tags for more info. 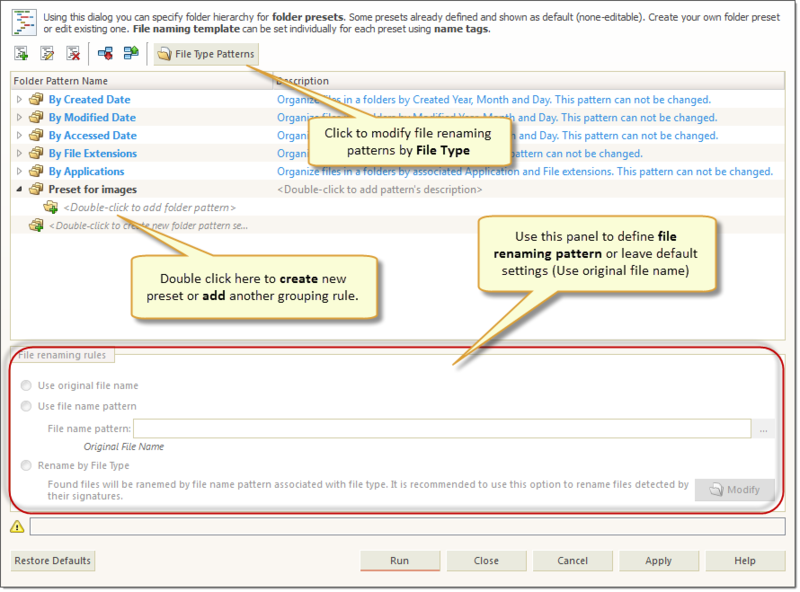 Select Rename by File Type option to rename all files in rule by renaming patterns associated with supported file types. See File renaming patterns by File Type for details. Click Run button to apply and execute selected rule or click Apply button to save changes. After rule is created, it will be automatically added to drop-down Organize Files menu in all related views and appear in context menu for file folders or file groups. Using file meta attributes for grouping or renaming may seriously impact file organizing performance.